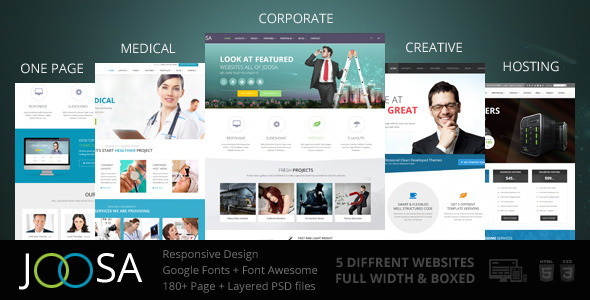 Corporate Templates are seek very often with free download and also made everyday but finding the best one suitable for your business might be a premium one if you are a startup. While considering a business template these days you should consider the website with modern design only like say flat, responsive, retina ready features etc. The theme must be atleast responsive as business websites are tend to be used by mobile and tablet users as well, thus it is an important requirement if you are going to do services globally. Like choosing between free and premium themes is optional as if you are already capable of little HTML,CSS editing you might not need the premium support. New business should go for premium themes as they have good support team who will guide you if you have some errors while integrating a new contact form, social signup etc. Premium themes come with a pre made contact form so you should have much time focusing on the content of the website rather than coding to make something different in style. We have taken a step further by introducing free html website templates in this section so that you can start trying out html templates if you haven’t done it yet. Other modern template options which interest many are single page templates where the whole website loads in a single page and where fast web hosting templates is essential as well. 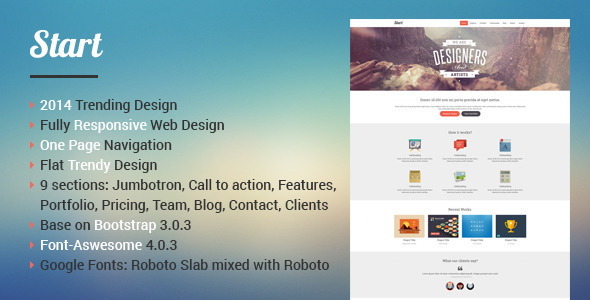 All template here are in HTML5 and CSS3 versions. Dont miss out these for more exclusive free templates. This is a good looking, simple and decent looking template which appeals all the users. The template is completely responsive and the images look great on all the mobile device screens and computer screens too. The template is built on HTML5 and is great to use. Only one website works for all types of devices. 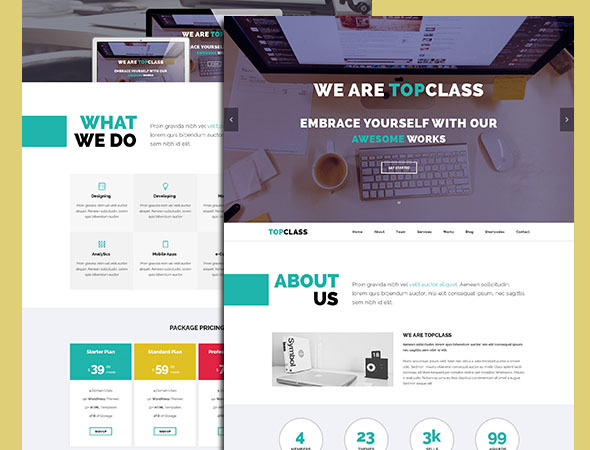 Developed and designed by Jewel Theme, top class is built with Bootstrap3.2.0, HTML5 and CSS3 and is a fully responsive template. There are three colours in which the template is available and all have portfolio page, 404 Error page, blog page, shortcode page, blog single page and portfolio details. It features the hover effect and has 4 sets of buttons that comes in various sizes and shapes. The template has been Search Engine Optimized and integrated with font awesome and animate.css. You can use Google fonts and also integrate your location as there is Google maps in the template. A fully responsive and retina ready template; Venda is an elegant, clean and simple which will solve all the problems of a modern business. The template has been built on Bootstrap 3 which also features 13 colour schemes, boxed and wide layout, Ajax contact form, touch sliders and carousal and many other features. 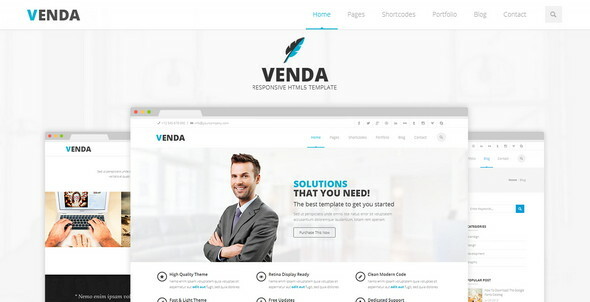 Venda is an apt template for company, portfolio, business websites and works great with blogs also. 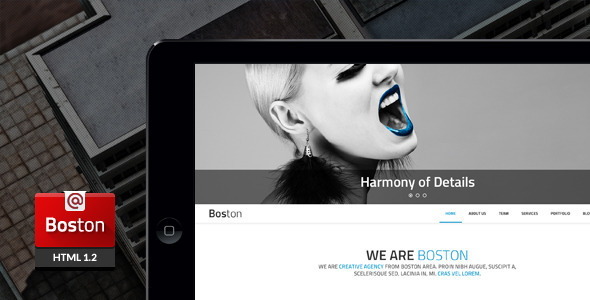 Boston is a premium template which features 5 various types of menus, Ajax unlimited portfolio works, revolution slider, unlimited colours, Live Twitter, lightbox preview and so much more. The template is built on Bootstrap version 3, HTML5 and CSS3 and has 18 homepage versions to offer. There is a dedicated customer support which will effectively look into your concerns in case you get stuck. Tuscon is a responsive and retina ready template which has thousands of possibilities with different features, colours, and other variations to customize your website as you like it. There are more than 350 icons, 5 header versions, parallax support, owl carousel, SEO optimization, Google fonts, touch swipe support and so many others. You can design a perfect professional business or portfolio website which will attract thousands of viewers to your website. The template is an elegant, simple ad clean responsive template which is perfect for corporate or business websites. 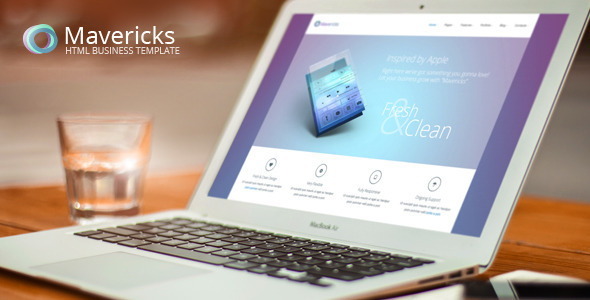 There are 6 different colours, 25 pages and 3 homepage layouts in this template. 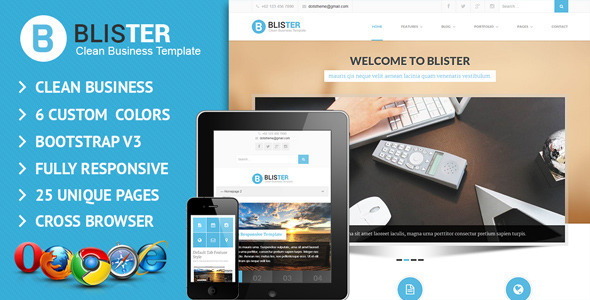 Blister is an SEO friendly, functional in all browsers and is well documented. Other features include amazing animation effects, swipe box photo gallery, contact form and many others. Mavericks is just the right solution to create a business website or a portfolio. The template has some dynamic functionalities and its designers has been inspired by Apple which is why the template looks like Mac OS X style which gives it a trendy look. The main feature of Mavericks is its fullwidth slider that showcases the crucial points which you would want to highlight to the viewers. The header holds the drop down menu and the logo while MailChimp widget, Flickr photostream, tags and posts make up the content. The template is easy to operate and highly customizable. 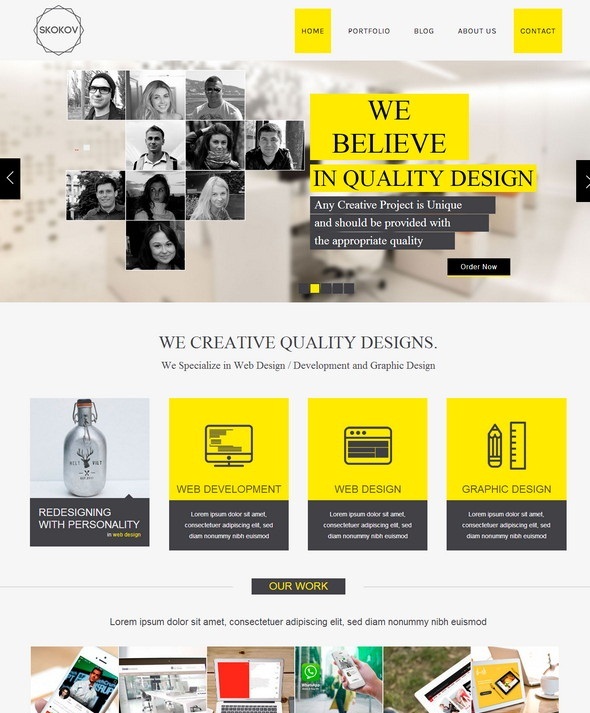 This is a professional, modern and clean business template which is fully responsive and retina ready. Elvyre has a modern portfolio layout which is full size so that you can display all your projects beautifully; it has been powered with premium isotope. It has parallax sections, revolution slider, 27 PSD files and every step for customization has been documented so you don’t face any problems while installing and building your website. The template is also browser compatible and works with all modern browsers like Safari, Chrome, Firefox, Internet Explorer 9, 10 and 11. Hideo is a premium website template which has been designed on Bootstrap 3, HTML5 and CSS3 and comes in two layouts fullwidth and boxed. There are 10 colour variations, 45 layouts and a revolution slider. It also features Ajax contact form, Google map and share plugin. There are hundreds of icons and a social share plugin too. Most of the components are ready to use like the menus, tabs, pricing tables, alert boxes, rounding images etc. It is a multipurpose and clean template which can be easily customized according to your requirements. 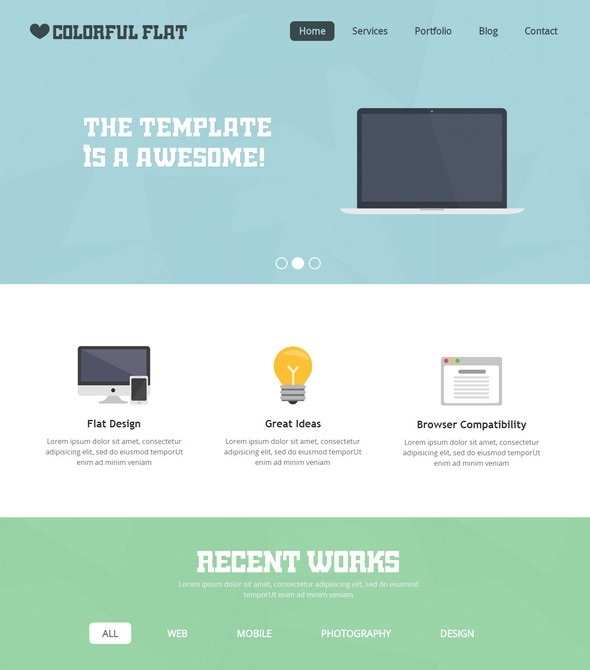 Start is a flat, trendy and one page design template which has been based on Bootstrap 3.1.0. The template is fully responsive and looks great on all screen sizes. There are 9 sections in this template; portfolio, features, contacts, call to action, clients, pricing table and team blog. It features Google fonts and isotope portfolio. The designers have well documented it and the template is of high resolution. Start is browser compatible and works fine on all modern browsers like Opera, Chrome, Firefox, Safari, Internet Explorer 9, 10 and 11. 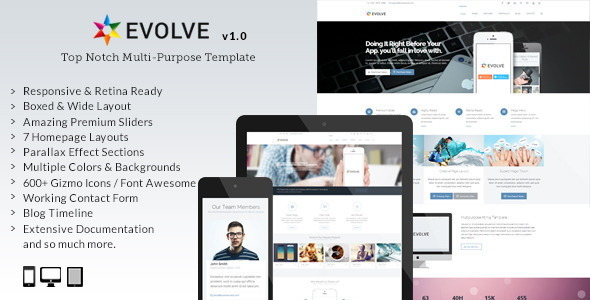 Evolve is a multipurpose website template which comes with 9 homepage variations, 14 colours and wide and boxed layouts. There is a revolution slider, tons of shortcodes and more than 650 retina ready font icons; you are not required to create the designs just put the code and create the icon. The parallax blocks give the website a unique look and rotation of text over the parallax images makes it look amazing. Evolve is best suited for portfolio, marketing, business, corporate, products etc. Multipress has a user friendly interface so your viewers or clients can easily locate the information they are looking for on your website. 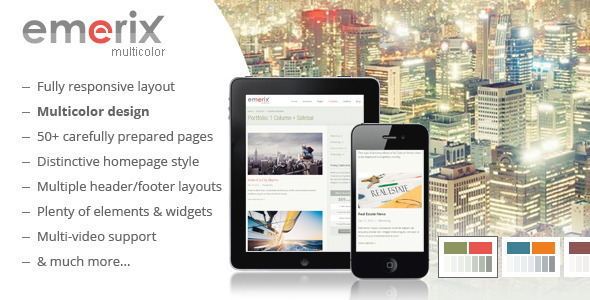 Boxed and wide layouts are fully responsive and the template has been coded using CSS3 and HTML5. You can set up your online store as there are hundreds of customization possibilities and many choices for colours and variations. 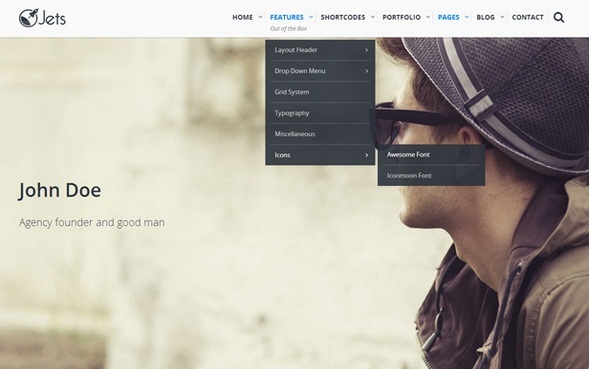 It features 5 header versions, 1 special footer, Twitter and Flickr feeds, flex slider and 2 styles of mega menu. 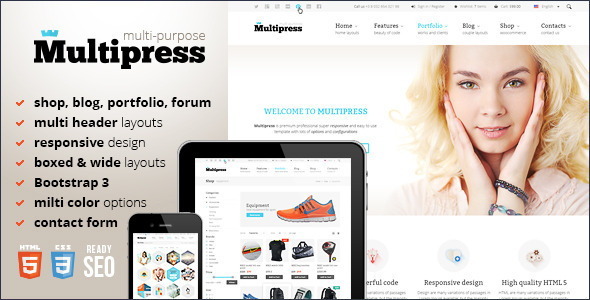 Multipress has been made SEO optimized and is compatible across all modern browsers. Joosa will give your website the corporate look you want for your business. There is a one page layout, medical layout, corporate layout, creative layout and hosting layout. It has been designed with HTML5 and CSS 3 and is a fully responsive template. It has awesome slideshows, many colour variations, unique pages and is easy to customize. It also features a slider revolution, many patterns, different colours and custom shortcodes. Sliders, pricing tables, FAQ’s, full page width, typography, testimonials, tabs are just some of the many features that Joosa has. Business and portfolio websites look great if created with Emerix. There are more than 50 pages designed in the template. A unique feature in Emerix is the multicolour design having 3 components combination of which gives the website an original and fresh look. It features 7 footer and 3 header layout variations, Google fonts, 3 layered PSD fonts and more than 400 icons. It has been SEO optimized, browser friendly and is fully responsive template. 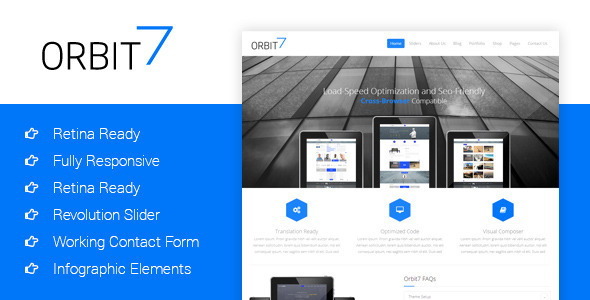 Orbit has been created with a fully responsive layout and has been made retina ready. It is a minimal template which has been inspired by iOS7. It features pricing tables, shop page, flex slider, revolution slider, filterable portfolio, testimonial slider, Google map, working contact form, fonts, sticky header and much more. Orbit is perfect for designing portfolio, news, blog, company or business websites. Including 30 HTML pages and 6 homepage variations this is a minimal and fully responsive template. The designers have focused on high quality code and details so layered PSD files can be obtained. Lightning is retina ready and features CSS files, documentation files, working contact form and JSS files. The template looks best for blogging, marketing, magazine and portfolio magazine websites. 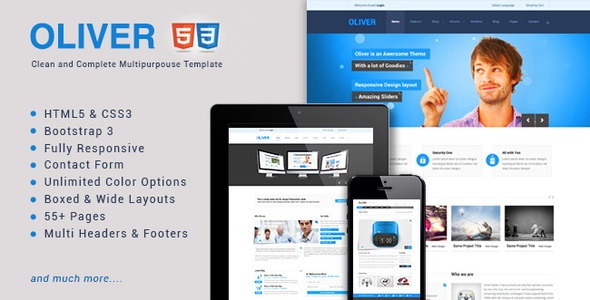 Oliver has been designed with Bootstrap 3 and coded with HTML 5 and CSS3. It has been made fully responsive and retina ready so even if the browser is stretched on small screen devices the images and the site still looks sharp and clear. There are colour variations using which you can change the skin and a functional contact form which can be used to input email subject, name or even a dropdown list can be selected. It comes in boxed and wide layouts and includes a revolution slider. Creative agency, freelancers, business, photo studio and portfolio websites look wonderful if created with Oliver. 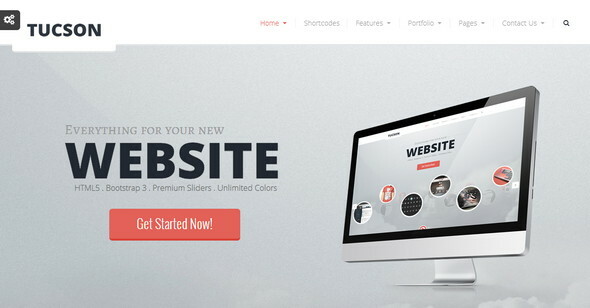 There are 78 HTML files in Nillbox and it is a fully responsive and retina ready HTML theme. The template is highly flexible and customizable according to the requirement of the users. Built with many features and short codes any website will be ready in no time. It has been designed with Bootstrap 3.0 and coded with HTML 5 and CSS3. 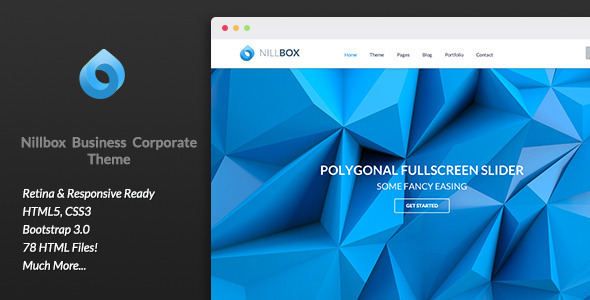 Nillbox is perfect to design a corporate, business and portfolio website. Designers of JET boast of the template to be equipped with all the modernity’s and web technologies. 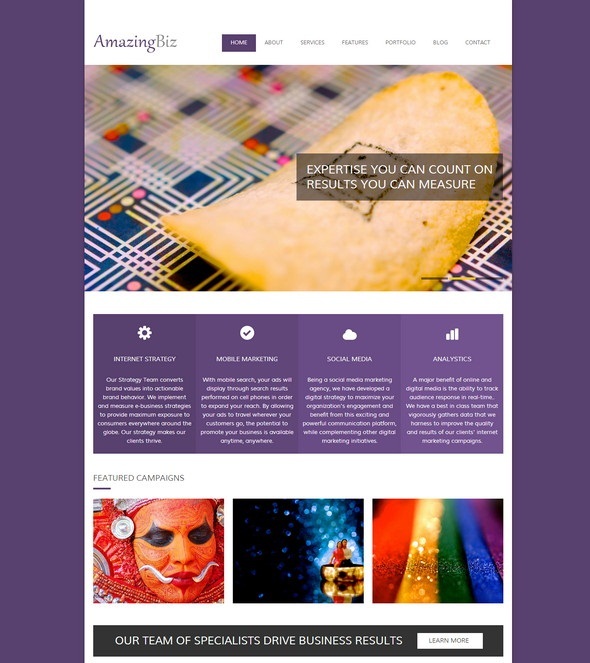 The template has been designed with bright colours and will make your website fresh and beautiful. There are 10 colour presets, 45 unique templates, mega menu, 5 header styles, 2 different drop down menus, responsive pricing tables, Twitter and Flickr feeds, touch swipe support, more than 400 icons, newsletter, parallax effect and much more. Jets has been made SEO friendly and is compatible with all browsers. 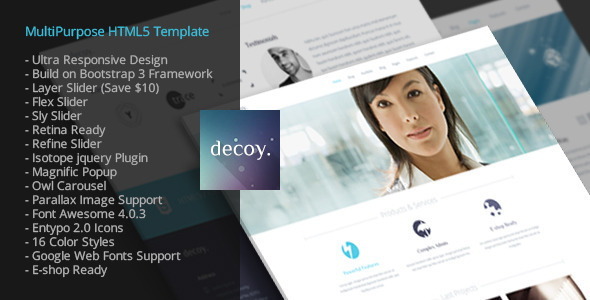 Decoy is has been made retina ready and is a fully responsive template which looks good for company websites and well as individual blogs. It features flex slider, layer slider, magnific pop-up, Owl carousel, around 16 colour styles and supports Google fonts. It is easy to customize and has been made Search Engine Optimized. There is also an e-shop which is ready to use. Zen7 is a premium template with hundreds of wonderful features. It has a modern, minimal and elegant look. There are 5 header designs and comes in two layouts wide and boxed design. It has been built using the latest technology of HTML5 , CSS3 and Bootstrap3 making it fully responsive and retina ready. Although Zen7 looks beautiful for all types of business websites, it looks best when used in creating any creative websites. 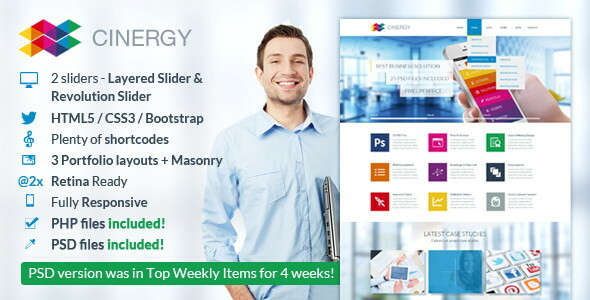 Cinergy is a modern business template which gives your website an elegant and fresh look. It is fully responsive and retina ready with 3 portfolio layouts. It has been designed on HTML5 and CSS3. There are many shortcodes which are easy to use and includes PHP and PSP files too. Cinergy is compatible with most modern browsers like Safari, Opera, Firefox, Chrome, Internet Explorer 9, 10 and 11. A completely free flat download single page template which is based on the trend of flat design is simple to use. The flat single page website is a multi-purpose web design and comes with blog showcase and four sections. 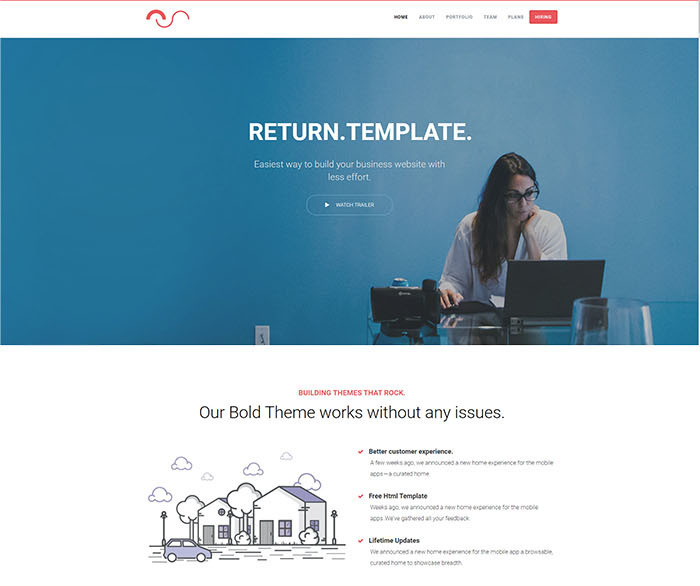 This template is completely responsive and can be used for business website or portfolio or any other website that you need to build. There are many features in the template like call to action, meet the team, contact us, header and footer and recent posts. Skokov is a wonderful template and perfect for making a creative website. The template includes personal portfolio, company profile, creative blog and much more. The template can be easily customized and the design is modern and classy. 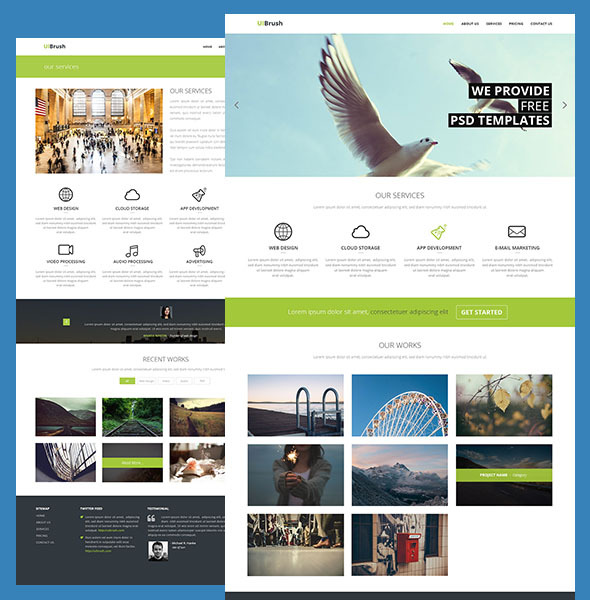 The multipurpose template is fully responsive to all sizes of screens and will give your company website a perfect look. 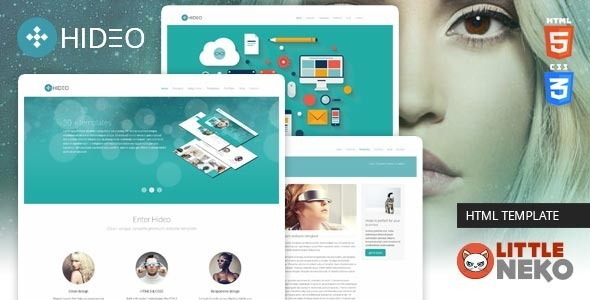 The HTML5 template is a fully responsive and free to download business template. The template has been designed to look great on all devices from computers to smartphones. Amazing Biz is also SEO optimized features a content gallery, fully functional 2/3/4 column portfolio, content/image slider and contact form. There are two layout, one is boxed and the other is wide. This single page website template has been designed using HTML5 and CSS3 and has been made to be responsive, which means that the website you design will look great on all types of device screens. 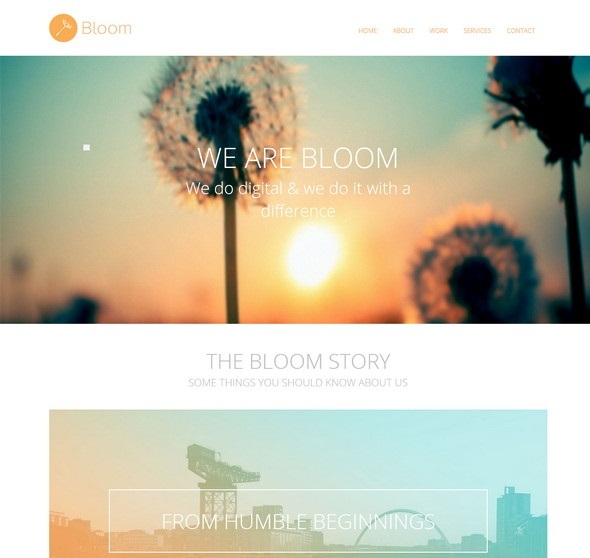 There are three versions of Bloom Smartphone web template, Mobile Web Template and Responsive Web template. You can download the version according to your requirement. 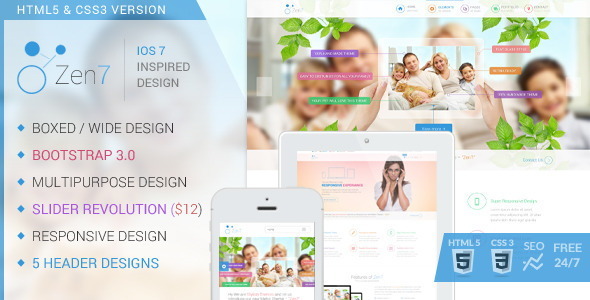 Bloom works best for corporate, personal and even a product display website. There are three colours in which the theme is available; orange, green and blue. You can select the colour which you like or which fits your requirement. The colour of the theme can easily be changed from the CSS. The template is user friendly and can be easily customized. 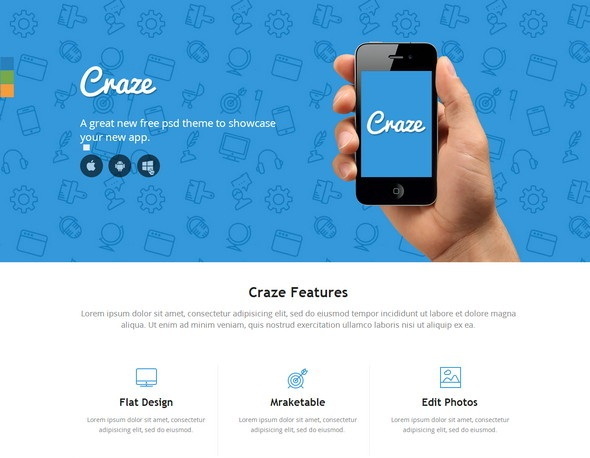 Craze is fully responsive and a single page template which best suits for a product or service that you wish to introduce. Thanks for the theme list.